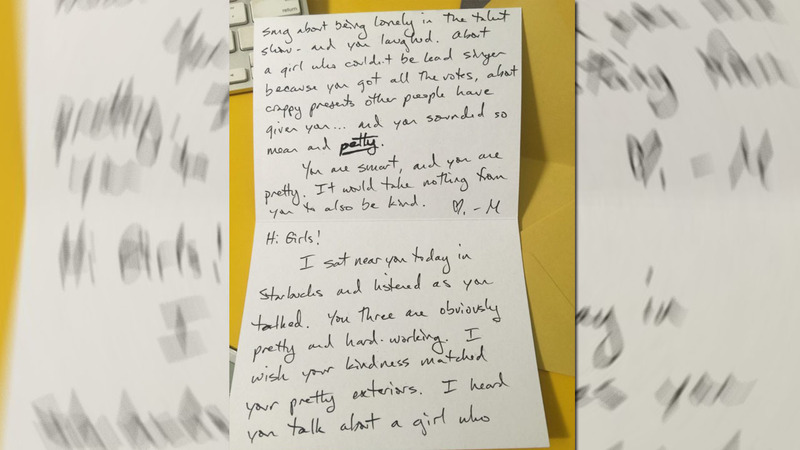 Note from Michelle Icard left to three teenage girls at a North Carolina Starbucks. A social media post from a North Carolina author is going viral after her note to three teenage girls at Starbucks. Michelle Icard, a frequent contributor on family and parenting issues, was sitting at a Starbucks over the weekend when she heard three young girls laughing and talking about a girl who wasn't present. According to Icard, the girls also started to complain about presents people had given them in the past. "I began to squirm uncomfortably in my chair," she wrote in her blog post. The conversation would then turn to the girls poking fun of a girl named Catherine. ICard eventually left the Starbucks to go grocery shopping. "The entire time in the store, I felt conflicted. Should I have said something? Should I have stood up for the Catherine's of this world?" she wrote. I sat near you today in Starbucks and listened as you talked. You three are obviously pretty and hard-working. I wish your kindness matched your pretty exteriors. I heard you talk about a girl who sang a song about being lonely in the talent show - and you laughed. About a girl who couldn't be lead singer because you got all the votes, about crappy presents other people have given you...and you sounded so mean and petty. You are smart and you are pretty. It would take nothing from you to also be kind. - M."
To read her full post, CLICK HERE.